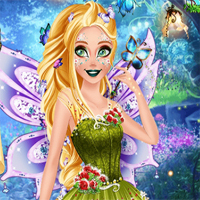 Discover the mythical world of fairies and create your own fairy version by playing this magical game! The options in this game are incredible so get started by choosing a fairy name. How amazing is that? Then, you get to be the most magical fairy of the woods with colorful dresses with flower details and a pair of wings. Don't forget your wand, you might just discover your own superpowers! Complete your fairy fashion style with a delightful makeup representing a specific fairy.